Here are some of the “Highest Point Lists” that TA is working towards completing. Click on the dates to read her training updates and dispatches from the climbs. Hii TA! I’m a 15 year old girl from central Newfoundland. I heard you speak at the leadership summit in Grand Falls in 2010. Your story inspired me and when i leave my high school I am going to be a high school Phys. Ed. teacher. I want to make an impact on peoples lives the way you have. Maybe someday I’ll be attempting Everest.. who knoes haha. Thanks for what you do.. you are a true inspiration and an amazing role model. I would love to be like you one day my dream is to be a famous singer. I am a 9 year old girl i sing dance and i also play guitar. i want to be kind of famous because i don’t want to not be able to go outside. this is tara again i just wanted to thank for writing me back.i really thought that you wouldn’t write me back in like a week or so because of your schedule.once in June i went to Gander with my family it was raining the whole entirer time. I’m always happy to reply when I can. I’m in Barbados now until Sunday-what a fun spot-lots of adventures to be had. I am so glad that you are coming to my school St.Teresa’s. I am so excited to meet you. I am a 9 yr old girl and i have big dreams and big goals. My dreams are to be a famous dancer, a dolphin trainer and to meet a person like you. I know to never give up on my dreams, and i learned that from you. I think that when I get to do my dreams that I will think about you and how you never gave up!!! I’m sitting beside the ocean in Barbados and picturing you training dolphins one day and that makes me smile. I’m glad you believe in yourself and you’ll go after your dreams. I am a big fan of yours. I am a 9 year old girl named Brianna.I love art and i like to sing and dance.You are a great role model too me.Me and my class will be so happy to see you and hear about your adventures.Do you think you will finish mount Everest. I really hope you do. I hope we can reschedule my visit to your school. I do love the snow but hate when in gets in the way of meeting great kids like you. I sure hope I get to the top of Mount Everest one day too! Keep singing and dancing! Thank you so much for replying. I can’t wait to hear about your exploration when you come to my school and i will follow my dreams!!! PS:I hope that you will get to the top of mount everest. That’s an exciting dream to work with dolphins. I love dolphins. I saw some once swimming in the bow wave of the boat I was on. Keep working hard to learn lots about science. Hope to see you at your school soon. That’s great that you want to climb mountains especially high ones! 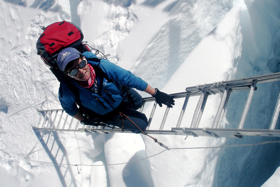 The world needs more female mountaineers. You’ll want to be active every day and learn lots in physical education class that will help you grow up and become a climber. Have fun. Thank you for replying and all the great information!!!! I agree that we need more female mountain climbers. you are an amazing person. I am so glad that you finally came to our school! I was so glad to meet you. And im just wondering but what place are you in now. Thanks for your kind words. I am currently here in St. John’s. I leave for Greenland on April 11. I hope you’ll follow along on the expedition. Hi TA! My name is Victoria, I’m 16 and I’m from Central Newfoundland. I can’t wait to hear you speak this weekend at our Leadership Conference in Gander! I’ll be the girl introducing you! Can’t wait to meet you! Hi Victoria! Thanks for writing. I look forward to meeting you on Saturday and presenting at your conference. Great pictures, see you soon.